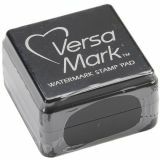 VersaMark Watermark Stamp Pad 1"Cube - VERSAMARK-A 1 cube of watermark ink stamp pad. For resist, tone-on- tone and watermark images. Archival, acid free, and non-toxic. Conforms to ASTM D 4236.